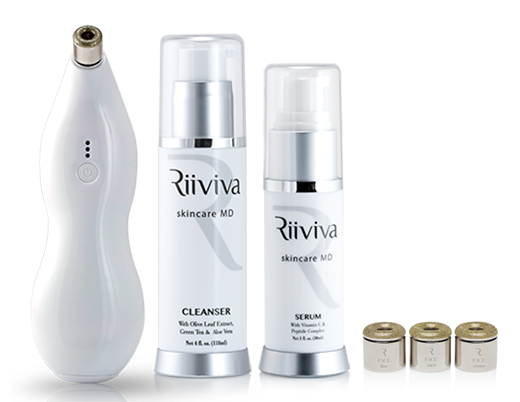 Welcome to another Riiviva Microderm Giveaway! Brought to you by Riiviva Skincare MD. The Microderm is an at-home microdermabrasion system worth $299 that delivers amazing results! I have one and love it! I have been wanting to try it out on some other areas on my body and plan to with some extra Christmas money. I have noticed an improvement in my skin texture and a diminishing in lines. It's something that I use every day and am amazed at how smooth my skin feels. It's quick and easy! I saw an article about one of the reasons men's skin looks good is possibly due to shaving. With the Riiviva, to me, it gives the same results as you are taking off the layer of dead cells to reveal brighter, smoother skin so it's a win-win for us. The giveaway is open the the USA and Canada and ends December 1st. The winner will be notified via e-mail and will have 24 hours to respond. The prize will be mailed by Riiviva and is not the responsibility of any participating blogger. My biggest concern is wrinkles. My skin concern is how oily my skin is all the time. I woke this morning and it was -1°F. Subzero temps to a number on my dry skin so keeping myself moisturized is always my #1 concern. My biggest concern is lack of elasticity in my skin! My biggest skin issue is large pores. I'm on the far side of 50 and sometimes look at the old lady in the mirror and wonder who the heck she is! My only concern is the rough itchy skin and pimples on my back. As far as my fiancee', I don't know, but she will get this if I win it. My biggest concern is sagging skin. Thanks for the giveaway! My biggest concern is dry skin and undereye puffiness. My biggest skin care concern is dark circle and crows feet. My biggest skincare concern is wrinkles.